The author of Stay With Me on how stories find you, remembering both sides of a proverb, and discovering your characters. In Nigeria, a woman named Yejide and her husband want to have a child and find that they are unable to. In order to save her marriage, Yejide focuses on getting pregnant. This is the premise of Ayobami Adebayo’s debut, Stay With Me (Knopf)—a novel that is now known for being the subject of famed critic Michiko Kakutani’s last review for the New York Times. 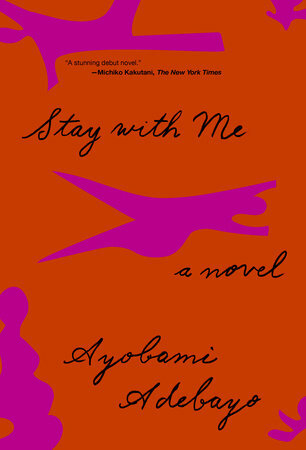 Originally out with a small press in Nigeria, Stay With Me has since been published internationally. Just under 30, Adebayo is already on her way to being a celebrated international author. Ayobami was spending her evening in Nigeria and I was spending my morning in Brooklyn when we spoke over Skype, discussing the instability of romantic love, shifting dynamics in familial relationships, and the importance of learning to be alone. Abigail Bereola: We start with Yejide and quickly learn that she’s a highly independent woman, a fighter both literally and figuratively, and very sure of herself. She is married to Akin and they married for love. But there are a lot of things that love doesn’t always bring, like happiness, or honesty, or children. For Yejide, in this context, the inability to produce children, means she will have to share her husband with another wife, since lineage and legacy are what matter above all else. In some ways, the story begins with the threat of the second wife. Why did you decide to start here? Ayobami Adebayo: Well, actually, when I was writing the book, it sort of started at the end. It started when everything had happened and then I had to work my way back to the beginning. And then I had to find a moment they could both look back to and point to as the moment when everything began to unravel, even though I feel that things were already sort of out of place before that time. I thought that in looking back at their lives—you know, I think that when we look back, sometimes we want to pick a particular moment or an image or something that we can hold onto as the beginning, and it felt that this was the moment that they would both acknowledge as the beginning of their end, how their marriage began to end as they’d previously known it. In the relationship between Yejide and Akin, they are both relatively equal, but they live in a place where, to the outside world, Akin’s manhood is supposed to take precedent. Much of their relationship in the novel consists of the inside/outside struggle of wanting what you want for your relationships, but not quite being able to ignore societal wants as well. Is this something you see often—the battle between what is traditional and personal desires? Yeah, I think that that is always a conflict. There is this overarching tradition and expectations about their marriage, but I also think that in different ways, it might just be your nuclear family and the expectations they have about your marriage and the way your life is supposed to go. So it’s always an interesting tension, I think. And I think it’s complicated by the fact that these are the people that you assume love you and care about you, you know? It’s a tension that is probably pretty common, that you can easily observe, if you pay attention to many relationships. Could you speak more about what you said about the people who are supposed to love you and care about you still wanting specific things for you? Yejide, from the beginning of their relationship, is not interested in polygamy. But what does cheating mean in the context of a culture where taking on another wife is possible and normal? So when she’s living in the ’80s, it’s something that’s a possibility, but more and more, younger people were turning away from that model and embracing monogamous relationships. But it’s all so difficult because they’re also aware—and I think particularly for many women, there’s the awareness that this is an option that’s valid, that the man can choose to explore if he’s unsatisfied with their marriage in any way. And for which he will suffer, really, no consequences—at least no negative consequences from the society. So, as it plays out in the novel, it’s an agreement that they both have in the beginning, but when he goes back on it, she’s not going to have anybody feel—I mean, people will feel sorry for her, but people will also remind her that, well, his father did it. Her own father did it. So, well, it’s not such a terrible thing. But it’s obviously something that comes at a great personal cost for her and for the marriage. And even for the man himself. [Yejide] exists in this cusp between a time when it was sort of the norm and in a new beginning where more and more people were embracing monogamy, but there was also an awareness in many of these relationships that it was a door that could open either way. That there was really no sense of permanence or security in this monogamy that quite a number of people were starting to embrace. The catch is that in their particular relationship, if Yejide can produce a child, a second wife would not be needed. And yet, Yejide recognizes that the path to motherhood is a potentially dangerous one, that she could have a successful pregnancy and give birth to a child, but die in the process. And in that case, in some ways, a second wife would still be needed. And this is something she considers and something she is okay with, or seems to be okay with, as long as a child is able to live. How, and why, did you settle on this depiction? What’s interesting for me particularly about the characters, at least two of them, is that of course there were definite decisions about structure and things, but they did feel like people who I discovered and then had to understand. So, it wasn’t so much a depiction as trying to understand who would make these decisions. This is someone who, herself, has grown up without a mother in a polygamous family. And the way polygamy works, your mother is… your refuge, in a sense. And when the mother is absent for whatever reason, whether the mother is late or the mother has left the marriage, many children feel particularly alone. And I think for her, it’s that she sort of idealized this image of family, of a man, a wife, and his child, and this unit that she desperately wants to be a part of in a way that is unchangeable. I think one of the things that she’s also very aware of is how precarious marital love can be. How precarious romantic relationships can be. And she feels, many times, that the real, permanent relationship—the one that is not mutable—would be the relationship that she has with her biological child. The kind of relationship that she’s had with her mother. She’s come to a place where this is sort of something she aspires to—the connection that she wants—for several reasons. One of them being that it would provide a kind of security that she becomes aware of, I think in the second chapter where the second wife is introduced. She imagines initially that she’s come into a relationship with her husband that will provide that kind of security and then she becomes aware of the fact that that kind of security might never be possible in a relationship where someone can walk away and say, ‘You’re no longer my wife.’ But she thinks to herself that if I have a daughter, if I have a son, that relationship can never be severed the way that Akin has severed this monogamous union. So it’s a desire that’s intense for her and for which she’s willing to sacrifice and take risks because in some ways, it’s quite primal and linked to trauma that she’s experienced earlier on in her own life. Often the relationship between a parent and child is actually severable and there are a lot of things that I think can come between them, but I do think that that’s often something that people think: if I can’t have this man, then I can have this child who will be mine. Yes, I mean, obviously it’s severable, as Yejide realizes in the novel. And not even always in such a final way as what happens with her. As you mention, quite a number of things can come between them and do come between them, and even in Akin’s relationship with his own mother, you see that it’s not a given, that any connection with another human being is not promised or to be taken as a given or for granted. That’s another dimension. It sounds a bit dark, I think, but ultimately, these characters—at least one of them does at some point—realize that she has to make peace with being alone in the world before she can have any meaningful connection with another human being. I mean, I wonder if that makes sense, that that state of being alone is so fundamental and central to being human. She just has to make peace with that, and the idea that for her, it’s complicated and more pronounced because of the family she comes from and how she feels lonely as a child, but the truth is that on the other side, Akin grows up with his family as intact as could be and still manages to carry a burden that makes him lonely for quite a while. So, as I said before, it’s kind of one of the things we have to deal with, being human. That being alone, having experiences that are sometimes so singular to us, is just part of this state of being human… I think that’s the other thing that underlies all that’s going on with these two people, that as important as connecting with other human beings is—it’s essential and we need it, we reach for it—we also need to make peace with being in our own selves. In Yoruba culture, there is a focus on legacy and oral history—who will be left behind to tell your story. And often, I think this focus is aimed toward children. There is so much wrapped up into the idea of children in general, the idea that if a woman can’t have a child, it doesn’t just say something about her physical ability, but about who she is morally as well. Why did you want to explore these things? Well, because I didn’t necessarily agree with all of it. And also because sometimes I feel that people focus on and reiterate certain maxims, proverbs, and conveniently forget other ones that temper the ones they’re reiterating. For instance, Akin’s mother keeps saying that it’s important to have children because they’ll be around to tell your story, they’ll be there to bury you and all of that. And this whole idea of a funeral and having children be there to perform certain rites, you know, it’s important. We go back and forth in the novel between Akin’s father’s funeral and Yejide coming back. So there’s that argument of, who’s going to bury you? And there’s this lovely Yoruba proverb, which basically goes, well, if you have children, children are going to bury you. If you don’t have children, children are going to bury you. So there’s also within the culture an acceptance of the reality that even for people who want to, some people will just not be able to, and when they do die, it doesn’t mean then that their bodies end up in the street or something like that. But you don’t often hear people say that when a couple is having trouble conceiving. I’ve sort of always wondered about the selective use of culture in support of a certain way of being or a certain idea. Those are things that I think about and I think it just all came together in wanting to look at what that means when you carry this to the extreme and what kind of effect it can have on people psychologically. It seems like there’s a lot of shame in it. Yeah, I think that the way it plays out sometimes, it would be very difficult, if not impossible, for many women who find themselves in that situation not to feel inadequate and maybe even pointless. How a person’s existence and value can sometimes be narrowed down to this one function. Sometimes when you think about it, it’s a bit terrifying. I think it can be very reductive sometimes in the way it plays out. All of this is occurring against a backdrop of class tumult and government corruption—the characters see it and fear it and discuss it—it informs their lives, but it doesn’t overtake them. Class insulates Yejide and Akin in ways that it doesn’t necessarily for others, like the housemaid who is tasked with opening letters that may carry bombs, but it also makes them targets because they’re sent letters that may carry bombs. Can you talk about this? When I first begun working on the novel, I was reading a lot about the ’80s and all that happened and this tumult. It was a very interesting—probably morbidly interesting—time. And I wanted to put everything into the novel. And then at a point, I realized that these characters really didn’t care directly about all of these things that I knew. In paring back a lot of what was political, I feel that I not so much discovered it as realized something about many middle-class Nigerians, particularly at that time, was that what many people began to do in the face of dictatorship was to insulate themselves as much as possible from the failures of the state and all the tumult that was going on around. And it was something that you could only do if you were privileged. You could only afford to do this if you were earning above a certain pay grade. You could only afford to build your wall that was as high as a prison if you had money to do this, and there were many people who couldn’t afford to do this, obviously. And it’s something that I still find interesting because I think it’s something that even now, after we’ve returned to democracy, I think it’s an attitude that still carries over for many middle-class Nigerians. “You know, there’s no lights—just buy a generator…” There’s no water, you sink a borehole. You become a mini-government to yourself. And it’s easy to pretend that everything is fine because you’ve built this system. But things are fine only because you can afford to make them fine for yourself and your wife and your children and your little family. Right outside of your gate, things are falling apart. One of the things that I think about often is how no matter how much money you use to insulate yourself personally, if the state is failing, there’s going to be a rupture at some point and you’re going to feel that impact. You might build up a mini-paradise for yourself in a place where things are falling apart politically, but it could turn out to be a fool’s paradise because there’s going to be that moment when I think you might wish that you’d done more. You also do have a voice, you know? And I think more and more now, in a democracy, you do have a voice that you can use. But if you’ve chosen not to use it because you can sort things out for yourself and your family, there’s always a moment of rupture where you need the systems to work. Sometimes it’s between life and death. And if they don’t at that point, it can be catastrophic. I think it gestures toward that at the end of the book, but it’s something I’m thinking about more and more now. I have very rarely, if ever, seen the depiction of sickle cell anemia in literature, despite the fact that it is a pretty common disease for black people—the National Institutes of Health say that 1 in every 365 black children in the United States are born with sickle cell disease and the Centers for Disease Control and Prevention says 100,000 children are born in Nigeria with sickle cell disease every year. Why did you want to explore the disease in your work? Like you mentioned, I can think of just one other book where it’s mentioned. It’s not something you see in fiction. And I feel that tangentially—not directly—it’s sort of been a part of my life in what has been a personal way. When I was in my late teens, early twenties, I lost a couple of friends to sickle cell anemia and it was devastating, obviously. But one of the things that it got me thinking about was how difficult it must be for their parents to continue. Because these are people I grew up with and our families were friends. I became aware shortly after they passed on that their mothers, their fathers would always be aware of the trajectory of my life, for instance, as they would be aware of the trajectory of the lives of other children that we’d gone to school together. My graduation, they would be invited. Things like that. And I just began to wonder, how do you even cope with this kind of event? And so I think that when I wanted to write this book, it just came naturally. It was just there at the back with all the things that were happening in this family, that this was also something they had to deal with. I guess, also, that it’s something that I think about often because I carry the sickle cell gene. I don’t have the disease, but I carry the gene. It means that I’m in that awkward position of finding a way to ask anybody I’m thinking about in that way if they’re also carrying the gene without sounding like you’re already thinking about having children with them, because that might not be on their mind. Yeah. It’s a lot of fun. It’s something that I had to think about early on as a young adult, about what kind of decision I was going to make. Because nobody’s going to stop you from marrying someone else who carries the gene, but I personally decided it wasn’t a risk I was going to take. But it’s something I thought about often because I still have friends who live with the disease and it’s just a little bit bizarre to not see something that’s a big part of many people’s lives, whether they live with the disease or they carry the gene and then it impacts so many of their romantic choices, just not seeing it represented. I wanted to write about it. There are a lot of ways that in the text, masculinity acts as a shield. In an interview with The Paris Review Daily, you said even if readers didn’t like Akin, you wanted them to understand him. Do you feel like Akin is unlikeable? And if so, how much of that, if any, comes from traits of his masculinity? I don’t know! I think I like him. I was very upset with him sometimes. I want to sit down and have a very long chat with him, but I think it’s just the character that I feel a little bit protective of because I’ve had people have very strong opinions about him. Those opinions have gone both ways. With Yejide, people have strong opinions about her, but it’s usually the same thing that I hear. But with him, someone says, “Oh my God, he’s such a devil.” Or somebody comes and says, “My God, you were so unfair to him. How could you treat him like that?” Sometimes it’s amusing. I walked into a room once for an interview in Lagos, and the gentleman who had read this book so closely said to me, “I’m angry with you.” That was the first thing he said to me. “I’m very upset about what you did to this man in this book.” And then we had a chat about that. So I think that comes from hearing people have what seems to be very divergent opinions about this man. But I don’t know. I think that also people bring all sorts of things to the text themselves. But I like him and I say this with a bit of trepidation because I think somebody’s going to read this and meet me at a reading and say, “How can you like him? !” But I do. I wish he made different choices, but oh my goodness, I think he’s also at a difficult time, too. What are the things that you normally hear about Yejide? Why was it important to you that Yejide get the last word? I think one of the things I worry about where Akin’s concerned and sometimes when I was working on the final copyedits for the book, I did think about him and wonder if he’d made a journey in the book. I feel that Yejide did—she has several journeys in the book. She aspires to motherhood and then she realizes that this is not all there is, and she’s alone and she finds a way to make peace with that, and then she comes to the end of the book and things sort of come full-circle. I feel that of the two of them, she’s the one who’s best positioned to speak of the future that could be and might be… And there’s the fact that Akin never says the words. He just doesn’t do it. He never allows himself to be vulnerable in that sense, even when she confronts him. I wonder about that sometimes. And that might sound bizarre, because of course I did write this. But I do wonder. He’s someone I have complicated feelings about. Like, dude. Come on. Just say it. But, you know. He has certain ideas about who he’s supposed to be, and I’m not sure that he ever quite divorces who he is from who that ideal is. I’m not sure he ever does that. He’s always the responsible first son. You know, this is going to sound very kooky, but I think that you choose your stories to tell and sometimes they choose you. Of course I started writing the story—I didn’t even think that this would be my first novel. I had another idea that felt more like a novel and then this story comes. And then it just would not go away. I first wrote it as a short story and then for two years, I was sort of obsessed with these people. And then I sat down and I started writing this novel. It turned out to be a difficult book to write on many levels. Technically, I had to figure out what the structure would be and then emotionally, it was difficult. And I remember thinking to myself, ‘Why am I doing this?’ I think that even looking back, I just felt a compulsion to tell this woman’s story. To just hold up this mirror, is sometimes how I think about it, and say, “Look. Just look at what we have the capacity of doing to people if we don’t rethink some ideas and the ways of thinking that the world should be…” I’m working on something else now that I’m starting to think, “Why am I doing this?” I get a lot of ideas, but there’s just that level of compulsion. That feeling that this is true and I have to get it out there. But of course it’s not—it didn’t happen. Yeah. But it is based on true things that could happen. Even if this particular thing didn’t happen. Yeah. So, I think for me, there’s a level of compulsion that gets it done. But I think part of it is also just curiosity about who are these people and why are they this way? Just that journey of getting to know people who are very different from you and have a different background and life story. That can be fun. At the risk of sounding very narcissistic, I’m going to say I write for myself ultimately. And maybe my sister. I think that when I’m working, it’s very difficult for me to think about an audience, perhaps because sometimes it gets a bit overwhelming. I’m trying to figure out so many things that I really don’t start thinking about the idea that other people might read this thing until, “Oh my God, it’s publication day” and I have a panic attack like “Oh my God, what have I done?” I think the awareness of an audience is something I’m just coming into because this is a first book. And when you’re working on the first book, there’s no guarantees. I think with any book. You don’t know if this will come together, you don’t know if anybody will care, you don’t know if any publisher will pick it up. So, it was mostly for myself and to have the satisfaction of having what I had put on the page match what I had imagined or come as close as I felt was possible. And I think that’s still mostly where I am. It’s been wonderful to have people read Stay With Me and respond to it. It’s been gratifying in many ways. But still, when I go back and work on something, I just can’t be thinking about that. There’s just no room when I’m working. Maybe in the moments in between, but when I’m actually doing the thing, no.